Bonnyrigg Rose could be a few months away from achieving their Lowland League dream, but they hope to deliver another statement of intent against a team from the top of the pyramid structure tomorrow. The New Dundas Park men have already knocked out top Lowland outfit BSC Glasgow in their path to the South Region Challenge Cup quarter-finals and face East Stirlingshire tomorrow on home turf for a place in the last four. 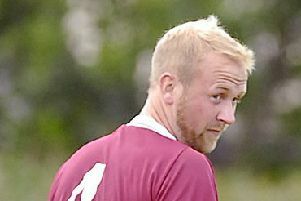 Robbie Horn’s men are in command at the top of the East of Scotland B Conference and could line-up in the Lowland League next season, providing they obtain their SFA licence and are able to navigate their way through a round robin play-off with the other two East of Scotland League conference winners. A spot in the semi-final of the competition would send out a real signal, but defender Ewan Moyes isn’t content to settle for just that, as he insisted he and his team-mates have the belief they can go all the way and even win the trophy. “The boys are looking forward to it, it’s good to get an opportunity to play teams at a higher level,” said Moyes. “It’s maybe been a bit of frustrating for some of us this season – not being disrespectful to anybody – but we’re used to the competitive games which we like and a lot of the games have been high scoring. It’s good to get a challenge, we just need to make sure that we get to speed quickly and hit the ground running because it’s been a while since we played a competitive fixture. “A lot of the games recently we’ve been winning pretty comfortably. It’s good to be able to face a Lowland League team as that’s the league we want to get into next year. “We are fully expected to get ourselves up to speed very quickly and raise the tempo. We’re making sure we are ready for it. Tomorrow’s tie is the kind of big occasion this tight-knit Rose squad have become accustomed to and relished in the last few years, with big Scottish Junior Cup ties and glamour Scottish Cup encounters. Moyes continued: “We’ve not had a big home game recently, so it’s nice to get that. The pitch was quite heavy over the winter but it seems to be back to it’s best again. We are looking to knock the ball about and take the game to them straight away. We fancy our chances against anyone at home, so we are confident. The team has been together for the last few years and we want to keep that going. “We fancy our chances in every competition we are in this year. Elsewhere, Lothian Thistle Hutchison Vale are also aiming to secure their place in the last four when they visit Stirling University. Raymond Carr’s men, who knocked out Spartans earlier in the competition, will take confidence from their recent run of form.